1957 was arguably the busiest year yet for seasoned director Billy Wilder. A prolific filmmaker releasing two films in one year is rare but not unheard of (The Big Stevens- Spielberg and Soderbergh– have both done it in several instances), but Wilder released three that particular year. The first two, THE SPIRIT OF ST. LOUIS and LOVE IN THE AFTERNOON, were ambitious works that fell far short of expectations, but he was just able to eke out a last-minute win with the third, WITNESS FOR THE PROSECUTION. Based on iconic mystery novelist Agatha Christie’s 1925 short story of the same name (originally published as “Traitor’s Hands), Wilder’s English courtroom drama netted Wilder his first Best Director nomination at the Oscars since SABRINA (1954). 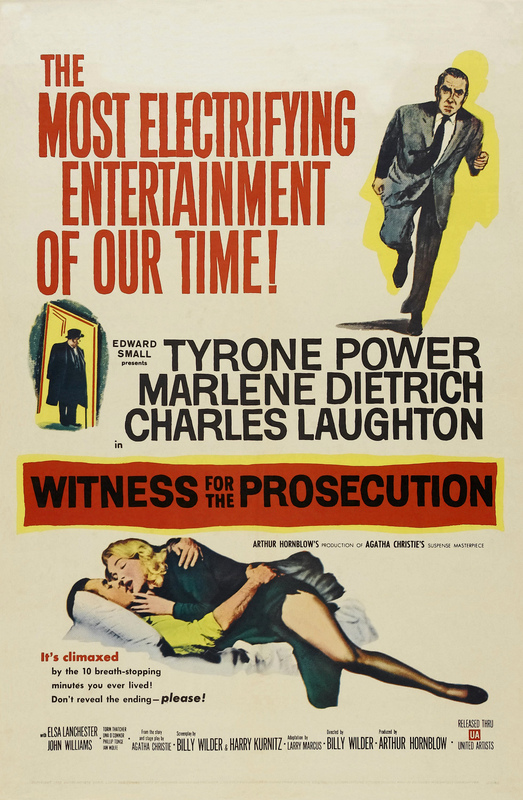 While not as classic as other films like SUNSET BOULEVARD (1950) or THE SEVEN YEAR ITCH (1955), WITNESS FOR THE PROSECUTION is strong enough to signify the first salvo in one last rally of great works by the master filmmaker. Working with producer Arthur Hornblow Jr for the first time since 1942’s THE MAJOR AND THE MINOR (in addition to Edward Small), the story of WITNESS FOR THE PROSECUTION as adapted by Wilder and Harry Kurnitz takes place in contemporary-era London. Celebrated actor and director Charles Laughton plays Sir Wilfrid Roberts, an accomplished and well-respected court barrister who’s just returned back to work, having been discharged from the hospital following a serious heart attack. Affecting a grumpy and stubborn personality reminiscent of Winston Churchill, he’s constantly swatting away the fussy commands of his prim and uptight nurse, Miss Plimsell (played by Laughton’s actual wife, Elsa Lanchester). On the day of his return, a man appears at his office in need of a lawyer— he’s just learned that he’s the prime suspect in the murder of a wealthy old widow. This man is Leonard Vole (Tyrone Power), an urbane wannabe inventor currently cashing unemployment checks. Power ably fills a role that Wilder initially intended for his frequent leading man William Holden, projecting a false facade of friendliness and dopey innocence in his last complete film performance before his untimely death via heart attack only a year later. Roberts can’t help but be intrigued by Vole’s case, and agrees to represent him. As the trial plays out in court (almost in real-time), a highly-unconventional witness is called to testify against him: his own wife, Christine Vole. Played by silver screen icon Marlene Dietrich in her second collaboration with Wilder after 1948’s A FOREIGN AFFAIR, Vole is a German immigrant and an ex-nightclub entertainer. She’s statuesque, cold, and calculating, checking all the boxes of the femme fatale archetype– but appearances aren’t quite what they appear to be. Something in the details of her damning testimony doesn’t quite fit with the whole picture, and Roberts feels compelled to delve even deeper into their knotty, murky relationship. Wilder deftly navigates the plot’s twist and turns, culminating in a big surprise ending that was considered so shocking at the time that Wilder included a voiceover narration over the end credits urging the audience not to spoil the film for others. Like LOVE IN THE AFTERNOON before it, WITNESS FOR THE PROSECUTION is a textbook example of Wilder’s technical aesthetic. The 35mm black and white film is presented in the widescreen 1.66:1 aspect ratio and shot by cinematographer Russell Harlan. Appropriate to its British setting, there’s a distinctly regal, stiff-upper-lip aura about WITNESS FOR THE PROSECUTION’s mise-en-scene. Like many of his Classical Age contemporaries, Wilder preferred the control afforded by shooting on soundstages instead of actual locations. As such, his films boasted impeccable production values like polished theatrical lighting and precise dolly and crane movements. In particular, Wilder liked the high contrast chiarascuro typical of the noir genre he helped to invent– a style reproduced with ease throughout WITNESS FOR THE PROSECUTION. He reinforced this approach with a focus on composition and performance, oftentimes staging his scenes in 2-shot masters to capture as much as he could. This is certainly true of WITNESS FOR THE PROSECUTION, which aims to document every inch of production designer Alexandre Trauner’s sets and every seam of Edith Head’s costumes. Even close-ups of particular characters are composed in such a way that the background is effectively a wide shot, emphasizing the greater depth and space around his subject. Editor Daniel Mandell was nominated for an Oscar for his work here, an edit that employs Wilder’s typically disciplined and minimalistic approach to coverage. However, the film does boast a few expressive flourishes, such as a shot that assumes Laughton’s POV zeroing in on a closeup of a cigar hiding in his colleague’s shirt pocket while he himself is elevating away from it. The courtroom dramatics of the narrative are a prime opportunity for Wilder to further explore the themes of occupational identity and class conflict. The crux of the tension revolves around the suspicious, unlikely friendship between Leonard Vole– an unemployed member of the middle class– and the rich old widow he’s suspected of murdering. His relative poverty in relation to her wealth drives the story, further reinforcing Wilder’s fascination with social status and inequality as a plot device. Occupational identity also plays a large role in WITNESS FOR THE PROSECUTION, as it does for nearly all of Wilder’s work. Because the film is set essentially inside of the courtroom and Roberts’ office, we can only glean insight into the characters through the prism of their professions– aside from the complicated marriage between the Voles, very little is divulged about the ensemble’s personal lives. The film’s baseline of morality is established by the lawyers and judges of the court, while the stakes of the story are laid upon the one character who has no occupation to anchor his ethics and worldview. The visual shorthand of uniform further reinforces this dynamic, with the image of lawyers clad in identical robes and wigs prosecuting a lone man in a shabby suit highlighting Wilder’s examination of institutional order versus the individual. WITNESS FOR THE PROSECUTION isn’t as fresh or as bracing as Wilder’s other works, with the director re-treading familiar ground to diminishing returns. The misanthropic, double-crossing nature of the Voles, who have no qualms about betraying each other to get ahead, is a lukewarm reheating of the deliciously devilish dynamic between Barbara Stanwyck and Fred MacMurray in DOUBLE INDEMNITY (1944). There’s also a flashback sequence that could be ripped straight out of A FOREIGN AFFAIR, where Leonard Vole first meets Christine performing in a nightclub while he’s stationed in the bombed-out ruins of Berlin. It’s easy to see why the story appealed to Wilder– the courtroom theatrics and nonstop procedural dialogue provide ample opportunity for writerly indulgence– but it makes for a somewhat monotonous viewing experience in a contemporary context, especially for those with low attention spans. To his credit, however, Wilder’s rapier wit and a surprise twist ending go a long way towards spicing up what would otherwise be a stuffy English law procedural in the hands of another filmmaker. WITNESS FOR THE PROSECUTION was well-received by critics upon its release, scoring a slew of Oscar nominations like Best Picture, Best Director, Best Actor and Supporting Actress, Best Sound, and Best Editing. My own opinions of the film aside, it’s remembered by the larger cinematic community today as a solid entry in Wilder’s canon– the capper to his most prolific year yet. After stumbling with THE SPIRIT OF ST. LOUIS and LOVE IN THE AFTERNOON, the success of WITNESS FOR THE PROSECUTION would give Wilder the momentum and energy he needed to make a renewed push for greatness. WITNESS FOR THE PROSECUTION is currently available on high-definition Blu Ray via Kino Lorber.